Stems: Erect, solitary to loosely clustered, mostly unbranched, hairy. Leaves: Numerous, alternate, simple, short-stalked to sessile, narrowly lanceolate to elliptic, 1 to 6 inches long, to 1 inch wide, thin, conspicuously 3-nerved, usually minutely-hairy below, rough or nearly glabrous above; margins shallowly toothed; tips pointed; lower leaves often absent at flowering. Inflorescences: Panicle-like, open or dense, cone-shaped or inverted cone-shaped; lower branches downward curving; heads usually only on upper side of branches, cylindric, to 1/4 inch wide; bracts thin, linear, yellowish; tips green, pointed. Flowers: Ray florets 5-18, less than 1/8 inch long, yellow; disk florets 2-8, yellow; stigmas shaped like spear points. Fruits: Achenes, tiny, short-hairy, tipped with numerous, whitish, hair-like bristles, enclosing small seed. Habitat: Open, damp or drying sites, hillsides, thickets, banks of streams, disturbed areas, and open woods. 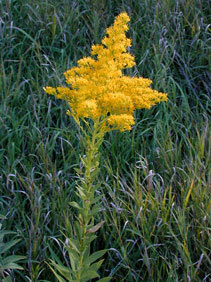 Uses: Native Americans used the flowers to make a medicinal tea used to treat fevers, diarrhea, and insomnia. Comments: Canada goldenrod commonly is encountered and quite variable. It is erroneously linked with hay fever; insects spread the pollen, not the wind.